"Friends are as companions on a journey, who ought to aid each other to persevere in the road to a happier life." 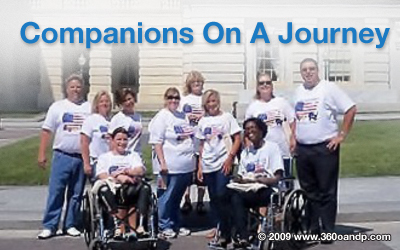 The August 2008 issue of In Motion, a magazine published by the Amputee Coalition of America, will forever be engrained in my memory. I had been a member of the ACA and a Certified Peer Visitor for some time but I never really stopped to read the magazine. Over the years, they just sort of piled up at my house and ended up in the garage. I returned to Tampa from a long trip to Texas, where I visited a fellow meningococcal meningitis survivor who was in the hospital recovering from bilateral below knee and bilateral below elbow amputations, somewhat at a loss for how to reach out to him. He had been a football player at school when he got sick. My presence seemed to inspire his family but seemed to have little if any effect on him. I am a bilateral BKA myself, missing a few fingers, and have permanent organ failure but my losses seemed very different for me. I am no athlete; I like shopping... shoes... and doing peer visits. The core of my vitality was not changed as much as his and I went home feeling rather ineffective as a peer visitor for the first time. On the plane ride home, I thought a lot about him and tried to figure out ways to reach out to him... I came up with some ideas, not knowing what might work. When I got home, I sorted through my mail that had been piling up over the week and upon glancing at the cover of my In Motion magazine, I was in disbelief! I sat in the living room, speechless for a good 10 minutes as I read the article. I couldn''t believe it. I am not so sure about destiny, fate, or whatever people want to call it but it was if someone placed this article in the magazine, just for me and my new friend. The article was about Rayna Dubose, a highly recruited basketball player who played at Virginia Tech. She was so good; she definitely would have had a career in professional basketball. Her sophomore year at school, she contracted the same disease we did and lost all four limbs. At the end of the article, was an email address. I send her a message explaining my predicament and asking for her help. I did not wholeheartedly expect a response, since I figured she would be a very busy lady. Much to my delight, a few days later, she responded and said she would be happy to help! I put the two of them in contact with each other and she helped/encouraged him along in his recovery both emotionally and physically. I also extended an invitation to her to join a non-profit organization that I work with to support families affected by meningitis. She did and later that year, we finally got to meet in person at the national conference. All three of us... sharing a devastating disease as the common thread we could have done without but using that thread to weave together an amazing friendship. Since that conference, Rayna and I have become even closer... we understand each other in ways that other people in our lives simply cannot. We have the support of amazing families, friends, amputees, and other meningitis survivors... but few can relate to exactly how we got to where we are. I eventually came to find out that she is a shopper too... and a hotdog eater... and an avid reality show watcher. One of my favorite pictures of us of all times is at the Capitol in DC watching a hotdog vending machine (and MAN were we upset when we found out it was broken)! She has taught me that with enough hard work our bodies can overcome even the most severe insult. I am amazed that she runs, walks even through big airports without using a wheelchair, and that she uses her story to inspire and help so many other people. I asked her if there was anything she had learned from me and she said, "You taught me to appreciate life because for us to be so diffrerent, we''re so much alike just because of a disease. I love the fact that you love life and are full of energy!" Rayna and I both speak at a lot of events across the country for various causes. Sometimes people that do the things we do and have survived what we have can be put on a pedestal. It is nice for Rayna and I to have each other to vent and unwind to. We are not superheroes. We are only people who happen to have more good days than bad but when we do have the rare bad day, we have each other... and a friendship that will last a life time!